The communication network wasn’t designed to carry the amount of traffic that is currently transmitted around the world on a daily basis. With the rapid expansion in data traffic and the exponential growth in high-speed communications, the current network is coming under increasing strain. At Bell Labs, researchers are looking into ways to improve energy efficiency through the use of optimized electronics cooling and energy harvesting technology. Two new energy-savings approaches developed by the group promise significant savings. Bell Labs, the research arm of Alcatel-Lucent, is committed to designing and implementing new technologies for significantly improving energy management for the next generation of telecommunications products. Working to meet this goal, Bell Labs founded the GreenTouch consortium, a leading organization of researchers dedicated to reducing the carbon footprint of information and communications technology. It is the goal of GreenTouch and Bell Labs to demonstrate the key components needed to increase network energy efficiency by a factor of 1,000 compared to 2010 levels. The Thermal Management and Energy Harvesting & Storage Research Group within the Efficient Energy Transfer (ηET) Department at Bell Labs (led by Dr. Domhnaill Hernon) is one such group working towards this goal. The department focuses on two main areas. One focus of the thermal research group is to deliver game-changing thermal technology into Alcatel-Lucent products across all scales and across multiple disciplines ranging from reliable active air cooling to single and multiphase liquid cooling. One way that this is done is through research for improving the thermal management of laser light transmission in photonic devices by developing an approach to achieve a 50 to 70 percent reduction in energy usage per bit. This approach is explored here. In addition, the department performs research into Alternative Energy and Storage solutions to enable power autonomous deployment of wireless sensors and small cell technology. In this blog post, we will focus on the production of an energy harvesting device used to power wireless sensors that can produce up to 11 times more energy than current approaches. In order to improve energy efficiency in photonic devices, the Thermal Management department is using multiphysics simulation to model new designs for cooling photonic devices, which rely on the thermoelectric effect for cooling. Photonic devices used for communications contain a thermoelectric material that is used to cool the device. In these materials, a temperature difference is created when an electric current is applied to the material, resulting in one side of the material heating up and the other side cooling down. When thermoelectric materials are used to control the temperature of photonics devices, the system is known as a thermally integrated photonics system (TIPS). Currently, a large thermoelectric (TEC) cooler is used to cool off the entire system within the photonic device. While TECs can be used for precise temperature control, they are highly inefficient. The group’s new approach improves thermal management by using an individual micro TEC (μTEC) to cool down each laser in the device. 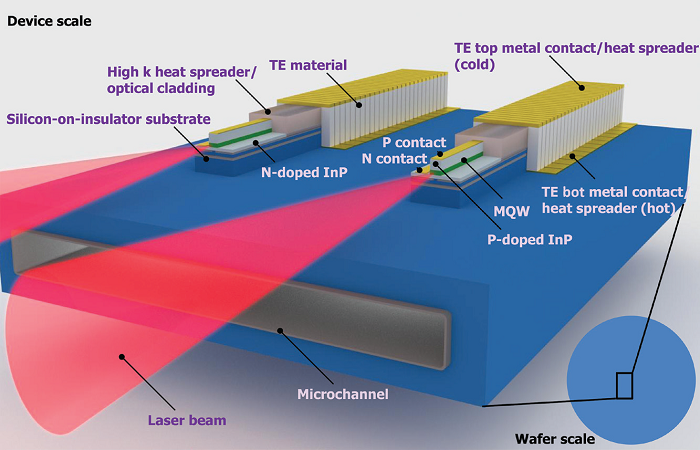 Schematic of the thermally integrated photonics system (TIPS) architecture, which includes microthermoelectric and microfluidic components. Using COMSOL Multiphysics, the team simulated a TIPS architecture to be used in new laser devices, including the electrical, optical, and thermal performance of the device. In addition to cooling, these devices are used by telecommunication laser devices in order to maintain the correct output wavelength, output optical power, and data transmission rates. The team investigated temperature control and heat flux management in the integrated TIPS and μTEC architecture using simulation. 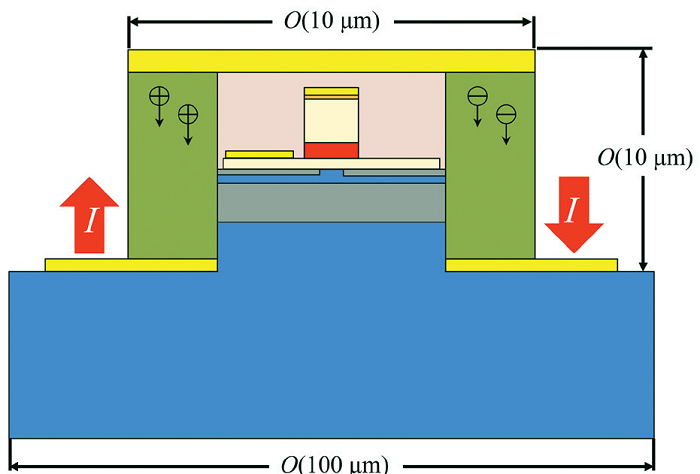 In particular, they investigated how temperature control can be archived in these systems through the integration of μTECs with the semiconductor laser architectures. The simulation of the integrated laser and μTECs can be seen in the image below, on the right. 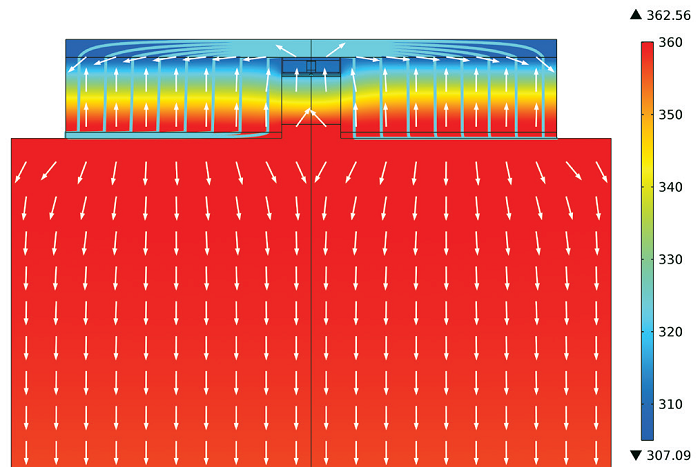 Multiphysics simulation of a laser with an integrated μTEC where temperature (surface plot), current density (streamlines), and heat flux (surface arrows) are shown. Another project currently being conducted by Bell Labs is the design of an energy harvesting device that can convert ambient vibrations from motors, AC, and HVAC into usable energy. This would prevent the need for the replacement of batteries used in wireless sensors frequently utilized across the network. Applications for this new design include the monitoring of energy usage in large facilities, and in sensors for the future Internet of Things (IoT). The team’s design used the principles of the conservation of momentum and velocity amplification to convert vibrations into electricity using electromagnetic induction. The device uses a novel approach with multiple degrees of freedom to amplify the velocity of the smallest mass in the system. Simulation played a big part in the design, as parametric sweeps allowed the team to determine how different structural, electrical, and magnetic parameters would affect one another and the design as a whole. 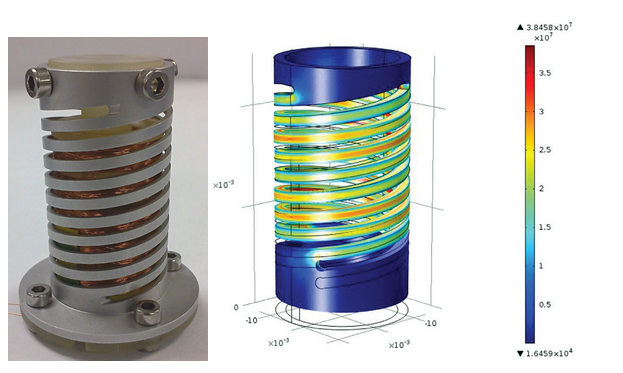 The figure below shows the novel design (left) along with the simulation of the device (right). Left: Prototype of novel machined-spring energy harvester. Right: Simulation of the energy harvester, showing von Mises stress. Although these new designs are not yet available on the market, researchers at Bell Labs believe that because of the accuracy achieved through their simulations, the devices should be ready for commercial production in as little as five years. Whereas previously these designs would have taken years of time-consuming physical testing, the Bell Labs team anticipates that these devices will be available with a much faster time-to-market, thanks to the use of multiphysics simulation. For more detail, read the full story “Meeting High-Speed Communications Energy Demands Through Simulation“, which appeared in Multiphysics Simulation magazine.